Eighteen-year-old Celaena Sardothien is bold, daring and beautiful – the perfect seductress and the greatest assassin her world has ever known. But though she won the King's contest and became his champion, Celaena has been granted neither her liberty nor the freedom to follow her heart. Celaena faces a choice that is tearing her to pieces: kill in cold blood for a man she hates, or risk sentencing those she loves to death. Celaena must decide what she will fight for: survival, love or the future of a kingdom. Because an assassin cannot have it all ... And trying to may just destroy her. I was hooked from start to finish! What a fantastic read! I was hooked from start to finish and missed out on many hours sleep. It was so unpredictable and full of twists. I loved the characters and world building. A must read! Can't wait to read the next book in the series. Throne of Glass was given to me for christmas by my brother.... who obviously (to me) never checked the target audience. Once I start something I like to finish it so regardless of the fact this series seems to be aimed at teens. I found it was surprisingly well written, great concept, moves well - quite a page turner. Even better than the first time I read it! Love these books! 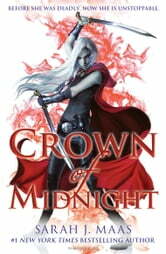 Awesome fast paced action packed fantasy book. Absolutely loved getting to know all the characters, really enjoying the this author writes.